Rally – Hyundai to US Rallycross?!? Some interesting photos have surfaced this past week in regards to a Hyundai Veloster rally car with Red Bull sponsorship down the side of it. While many have no idea exactly what the deal is with this picture, a look at the windshield banner makes the intent clear. 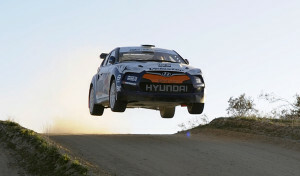 On 9 Feb, it would appear that Hyundai will announce its entry into the new US RallyCross championship. The new RallyCar project series held three exhibition rounds at New Jersey Motorsport Park last year and is looking to up the number of events to at least six for this season. Locations have yet to be announced at this time. Details on the car itself are few, but this would give the series a shot in the arm no question. The American series had a number of foreign entries last season that saw Citroen C4, Ford Focus WRC machines, and of course our own domestic Subaru US Rally Team. The stock Veloster boasts a 1.6 litre engine with front wheel drive. So it is unclear at this time if a 4WD version will be made available for the purpose of rallycross. I think it is going to slot into the 2WD class myself. If Chris Duplessis brings the Scion to rallycross this season, we will see some direct competition between Toyota and Hyundai. Makes sense to me. So hold on for 9 Feb when the car hits the Chicago Autoshow and more details are released on the car itself. However, I think it is safe to say that rallycross here in the States just picked up a hot little 3 door from….Hyundai?!? Still trying to wrap my head around it.